Emily and Yosem invited me to capture their San Francisco City Hall Mayor’s Balcony Wedding photos. I have documented many a San Francisco City Hall wedding in my career, but few have had such a cohesive sense of style from beginning to end. One of the most exciting things for me is to hear my clients articulate their vision for the wedding day. Even more thrilling is to actually see that vision come alive, and of course to be there to document it! Emily, Yosem and their families planned a truly grand affair for the couple’s day – a 1920’s/30’s theme ruled the day. San Francisco City Hall is one of the oldest buildings in San Francisco. It was completed in 1915, just a few years after the earthquake and fire destroyed the previous building. Emily and Yosem wanted the to stay true to the feel and the history of City Hall, and so they planned outfits and cars that evoked this much earlier time. Their San Francisco City Hall Mayor’s Balcony wedding photos actually began with elegantly-clad guests enjoying a cocktail reception at the Kensington Park Hotel. 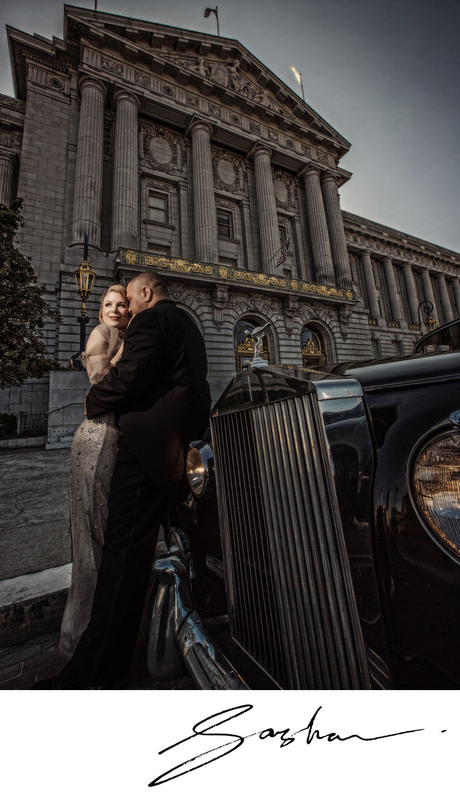 Then a fleet of Rolls Royce cars arrived to ferry the attendees to the wedding ceremony at San Francisco City Hall. During the ceremony, the guests watched Emily and Yosem exchange rings on the Mayor’s Balcony, as the grandeur of City Hall unfolded behind the couple. A champagne toast, formal photographs, and then the couple and I escaped to do our grand photographic tour of City Hall, while the guests enjoyed an official tour of the building, conducted by the docent. Finally, the day concluded with a lovely dinner reception at Farallon: delicious food, a beautiful cake (created by the bride’s sister! ), and a hilarious quiz game were the highlights of the evening. Thank you, Emily, Yosem, and your families, for inviting me to provide your San Francisco City Hall Mayor’s Balcony wedding photos! Congratulations!